The Acer Predator Z650 is designed using bleeding-edge technology to give you the ultimate edge when gaming. The Predator is capable of projecting a Full HD, 100-inch image just 1.5m from the projection surface. Never miss another shot with 3 Gaming presets, a mighty 2,200 Lumen lamp and automatic keystoning and 4-Corner Correction technology, meaning you can project the same crystal clear image no matter where you are or what you're playing. 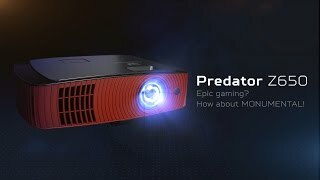 The Acer Predator Z650 gaming projector gives you gaming on a monumental scale putting every epic kill, every pixel-perfect jump and every glorious cutscene into sharp focus with full HD, 3D, three Gaming Modes with ColorPurity and a 100" screen with the projector just 1.5m away from the projection surface. Whether you want a fast-paced shooter, thoughtful strategy or detailed racing sim, the Predator's 2,200 Lumen lamp works with 3 intelligent Gaming modes and sophisticated automatic Keystoning and Four-Corner Correction to ensure your image is always razor-sharp and focused.